Martin Masse is publisher of QL. Paul Beaudry is a lawyer based in Montreal. 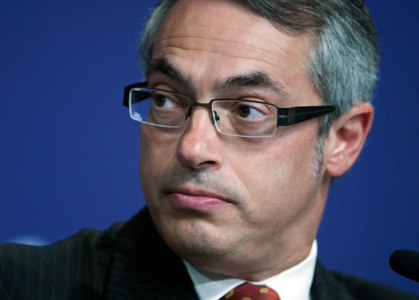 At a House of Commons committee last week, Industry Minister Tony Clement reiterated his decision to overturn a CRTC ruling that would allow large telecom and cable companies to impose "usage-based billing" on alternative ISPs with whom they have to share their networks. He said his policy aims for the sector have always favoured more competition and more choice. Earlier, Clement had criticized the CRTC for "forcing a single business model on competitors" by effectively killing unlimited Internet plans. Such language is misleading. The likely outcome of the government's actions will not be the unshackling of the broadband market but the maintenance of a regulatory straitjacket on large telecommunications and cable companies, which will discourage genuine competition and innovation. This latest telecom controversy is part of a larger debate about whether incumbents should be forced to share their network infrastructure with thirdparty providers at regulated wholesale rates. Such regulatory practices are common in the telecommunications sector, having been applied in the wireline market when national monopolies were broken up two decades ago. The rationale for mandatory network sharing has been that those smaller players will eventually amass the necessary capital to build their own networks. It thus provides a "stepping stone" for new entrants to become real competitors, which should eventually benefit consumers. Study and practice have shown, however, that attempting to foster competition in this artificial way has generally failed. In most cases, the small companies benefiting from such policies have come to rely on them for their survival and never develop their own infrastructure. This is why alternative ISPs are today lobbying the government to effectively nationalize the telecom infrastructure and turn it into a public utility. They know they will never become real competitors able to stand on their own and they want what were supposed to be temporary measures to become permanent. The Telecommunications Policy Review Panel, which reported its findings to then-Industry minister Maxime Bernier in 2006, acknowledged the failure of those policies by noting the scope of mandatory wholesale access was too broad and needed to be narrowed down. Echoing the panel's finding, the government issued a policy direction to the CRTC directing the regulator to rely on market forces to the maximum extent feasible and to regulate only as a last resort when exercising its powers under the Telecommunications Act. More specifically, the policy direction stated that in implementing regulations relating to regimes for access to networks, the CRTC should "ensure the technological and competitive neutrality of those arrangements or regimes, to the greatest extent possible, to enable competition from new technologies and not to artificially favour either Canadian carriers or resellers." "The CRTC's decision on usage-based billing is not only sound as a matter of public policy, it also respects the spirit and letter of the policy direction. Contrary to what Mr. Clement and other critics are saying, the regulator is not imposing a business model on the industry." The CRTC's decision on usage-based billing is not only sound as a matter of public policy, it also respects the spirit and letter of the policy direction. Contrary to what Mr. Clement and other critics are saying, the regulator is not imposing a business model on the industry. It decided to stop imposing one that was unrealistic, biased in favour of resellers and interfered excessively with market forces. In pressuring the CRTC to rescind its ruling, the government is disregarding the principles it asked the CRTC to rely upon when it issued the policy direction in 2006 and seems guided only by the need to address the public outcry that followed the decision. This is not to say the federal government should never overturn the CRTC on policy questions. The Telecommunications Act provision allowing the federal government to vary, rescind or refer back a decision to the CRTC for reconsideration has proven useful in the past. Mr. Bernier used this power twice to accelerate the deregulation of VoIP services and local telephony. In those instances, however, it was clear the CRTC had strayed from the principles that were enshrined in the policy direction. His successor should actually have used it last fall to overturn another CRTC ruling, which will force the telcos to give alternative ISPs access to their network at the same speeds as the services they offer to their own retail customers. This means every time the network owners invest billions of dollars to increase the speed and efficacy of their services, resellers get to benefit from it, even though they have not invested one cent to develop those services. In its ruling, the CRTC does recognize that as technologies and markets evolve, mandated access will eventually be phased out when there is "sufficient" competition. But the ruling ensures that smaller players will never need to make the investments necessary to build their own infrastructure and provide that competition, since their access to all future improvements in the network has been guaranteed. Mr. Clement chose not to contest that ruling. And now, he wants alternative ISPs to be able not only to resell next-generation broadband services, but to resell unlimited amounts at a regulated fixed price that has nothing to do with market conditions. A much more efficient way to increase competition would be to change the law to allow foreign competition in the sector, without bungling the process as he did with Globalive. In sum, the government should only interfere―but then always interfere―when the regulator strays away from the principles enunciated in the policy direction or in the Telecommunications Act. With his erratic decisions, Mr. Clement has made a mess of what should have become a clear and consistent telecommunications policy since 2006, grounded on freer markets and lighter regulation. * This article was first published in the National Post on March 8, 2011. Paul Beaudry and Martin Masse are fellows of the Montreal Economic Institute. They both worked as policy advisors to Industry Minister Maxime Bernier in 2006-07.